Note: Due to the increasing share and importance of natural gas in the United States’ energy portfolio, IPAA’s Declaration of Independents initiative will also focus on the impact of natural gas (in addition to our previous oil coverage) on global trade, economy, and job creation in the U.S. and beyond. Also stay tuned for more shale play profiles. In our previous article, we focused on how the rising trend for domestic production, especially for oil, was benefiting the U.S. economy with increased jobs, and at the same time improving the country’s trade balance, its geopolitical standing, and its economic impact on world energy markets. Our focus now shifts to the parallel stimulus from the dramatic revival of American natural gas production. As noted in the prior article, U.S. natural gas production reached an all-time high in 2011, and then surpassed that in 2012 at 25.3 trillion cubic feet, its seventh annual increase in a row. Marketed production for January-October 2013 (latest available) is maintaining, if not exceeding 2012’s level. In addition to dry natural gas produced from natural gas wells, these production figures include natural gas produced as a by-product from oil wells, known as “associated gas.” It also reflects the production from “wet” natural gas wells, the economics of which are strongly influenced by the potential value of extracted natural gas liquids (NGLs) in addition to the natural gas itself. Natural gas is the country’s second largest energy source after petroleum, making up 27.4 percent of total energy consumed. The share of that natural gas coming from domestic supplies is now at 94 percent, the highest in 25 years. The shale technology revolution has made all-time record amounts of natural gas available to the domestic market. This abundance has provided benefits in electric power, the fastest growing demand sector, as well as industrial and transportation markets. Natural gas has given electric utilities more fuel choices for power generation, resulting in a shift away from coal. In 2005, natural gas provided just 15 percent of the energy inputs for electric power generation in the U.S. while coal provided 52 percent. By 2012, natural gas’ share had surged to 24 percent, while coal’s had dropped to 41 percent. In 2012, natural gas was the top electric power energy input after coal; nuclear power supplied 21 percent, hydropower, seven percent, wind, four percent, and biomass, one percent. So far in 2013, natural gas usage for power generation, though it has moderated from 2012 levels, remains more than seven percent above the same January-September period for recent years. The availability and affordability of American natural gas gave a boost to the industrial sector with initial signs of a more widespread resurgence. According to a recent Energy Information Administration (EIA) survey, “The 36 percent decrease in the average natural gas price paid by manufacturers between 2006 and 2010, from $7.59 to $4.83 per million Btu, was large enough that the total cost of energy from all sources fell by 11 percent …. Since that survey was conducted, natural gas prices have fallen further.” The International Energy Agency, in its most recent World Energy Outlook, adds, “Lower gas and electricity prices in 2012 in the United States relative to Europe equated to estimated savings of close to $130 billion for the entire US manufacturing industry.” For industries such as steel, where energy can account for up to 40 percent of the manufacturing cost, this is a significant development. Also, interest in natural gas as a transportation fuel has been growing. Many municipal bus systems have adopted natural gas fleets, with one-fifth of all transit buses running on natural gas, according to the American Public Transit Association. Some long-distance trucking companies have added natural-gas powered trucks, and even some exploration companies have included natural-gas powered vehicles in their operations. Railroads are interested in natural gas as a potentially economical fuel, while heavy equipment manufacturers are also exploring similar options. Refueling is one of the challenges, but there are already more than 1,000 refueling stations across the U.S. (including fleet-only) according to Natural Gas Vehicles for America, with numerous plans to expand refueling capacity further in various places around the country. The increase in American natural gas production, as with increased oil production, has helped to reduce net import reliance for the U.S. Import reliance for natural gas has historically been lower than for oil, and with recent trends, that reliance has fallen further — from 16 percent of domestic consumption in 2005 to six percent in 2012, the latest annual data available. The reduction in net imports for natural gas has played out differently than for oil because of the significant logistical differences between the two. Oil’s liquid form allows it to be easily shipped around the world, and the U.S., as the world’s largest refiner, has expanded its product exports dramatically in response to strong growth in world demand (in contrast with stable domestic demand). For natural gas, only neighboring Canada and Mexico can be reached by pipeline. Any exports to farther destinations require tanker shipments of liquefied natural gas (LNG), which can involve multi-year lead-times to seek approvals, major investments in liquefaction and export facilities, and time to line up customers – all processes that are taking place even as this is written. Nevertheless, the most immediate effects of the U.S. natural gas supply resurgence have been on trade with the country’s North American neighbors, particularly reduced imports of natural gas from Canada, and even increased exports to that country. From 2005 to 2012, imports from Canada to the U.S. fell from 3.7 trillion cubic feet to under 3.0 trillion cubic feet. At the same time, U.S. natural gas exports to Canada rose from 0.4 trillion cubic feet to 1.0 trillion cubic feet. The result was a 40 percent drop in net imports of natural gas from Canada, with an additional 12 percent, year-to-year decline through third quarter 2013. On a smaller scale, exports to Mexico have simultaneously increased from 0.3 trillion cubic feet in 2005 to 0.6 trillion cubic feet in 2012, continuing to rise in 2013 as (the reverse of the U.S. situation) consumption in that country has risen faster than internal supply. According to the EIA, Mexico relies on U.S. supplies for about 30 percent of its natural gas needs. With the recent constitutional reforms there, Mexico could enhance its own domestic production if opportunities open for participation with U.S. producers and their expertise in shale and deepwater plays. Meanwhile, natural gas from more distant areas, shipped as LNG, had accounted for nearly 17 percent of U.S. imports in 2007, but diminished to less than six percent of that shrinking total in 2012, and less than that through the third quarter of 2013. Increased domestic natural gas production has translated into greater availability of extracted natural gas liquids (NGLs), leading to both record domestic usage and record exports. The volume of NGLs supplied to the domestic market reached an all-time high of 2.30 million barrels/day in 2012, and was running about five percent ahead of a year ago through November 2013. Exports of NGLs (including liquefied petroleum gases, or LPGs, as well as heavier NGL components) jumped from 60,000 barrels per day in 2005 to over 300,000 barrels per day in 2012 and averaged over 450,000 barrels/day for January-October 2013. Over three-quarters of these exports are going to Western Hemisphere destinations, from Canada to Chile. Historically, these exports have consisted of propane and heavier components, but some companies are considering the possibility of exporting ethane, as well, which would require special tankers to ship it in liquefied form. With the abundant natural gas supplies in the U.S., combined with growth of potential markets overseas, interest has grown in exports to more distant destinations beyond Canada and Mexico. Such exports necessarily involve building facilities, including those to transform the natural gas to liquid form and to accommodate tanker loadings. Also needed is federal approval to export to non-Free Trade Agreement nations, not to mention the need to line up long-term customers. Thus, LNG exports involve lead-times measured in years with substantial up-front investments measured in billions of dollars. The U.S. currently continues to import diminishing volumes of LNG, and U.S. exports of LNG are even smaller, amounting to just 0.1 percent of domestic production in 2012. More than half of these were re-exports of LNG imported from elsewhere. At this point, the Department of Energy has approved LNG export licenses to four facilities, with another 20 or so applications at the agency awaiting consideration. Even with current and any future government approvals, there is no guarantee that all projects will be built or be economic, but the export potential is worth monitoring given the incredible supply unlocked by producers. The strength of U.S. natural gas production, just as with the rise in domestic oil production, has enhanced U.S. economic well-being. Ample supplies of American natural gas have led to the creation of American jobs both directly and throughout the value chain. Increased availability of natural gas has spurred economic development and investment in American manufacturing by offering greater flexibility in energy inputs and feedstock, while also providing more economical and emissions-friendly energy inputs for electricity generation. All of these are helping to put the U.S. on a stronger footing in the international economic arena, while reducing U.S. net energy imports and improving the U.S. trade balance. As with oil developments, the reduced reliance on energy imports is a step towards greater national security and stronger economic competitiveness. 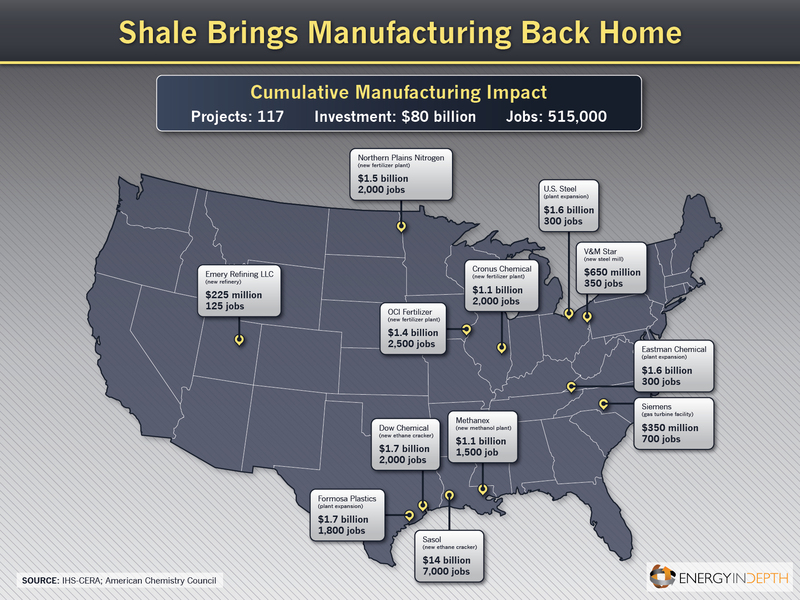 Check out Energy in Depth’s map to see how shale is bringing manufacturing back home.